Hancock after 1839 was a growing community full of businesses that targeted the canal for business and transportation. The materials on the towpath were likely waiting for shipment up or down stream or could have possibly been used for the repair of canal boats that travelled up and down the waterway. The building in the foreground is thought to be a canal company carpentry shop. The building in the center background is the warehouse and store of Philip Thomas Little. Oral histories of men and women who worked on the canal during the years of operation claimed that in some areas the canal was clean enough to swim in. These boys are jumping off the boat and swimming even as the mules are still pulling. 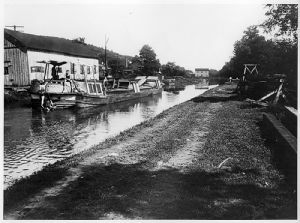 Boat basins along the canal served as areas in which business between the canal boats and industry along the canal could occur without obstructing the flow of traffic along the canal. They were also places in which canal boats could dock for the night or could wait for a turn through a lock or across an aqueduct. Many industries had access to boat basins such as at Antietam Village, Millers Saw Mill, Cushwa Warehouse, and many others.